We invite you to contact us today to discuss your care. Please don't hesitate to call us at (319) 624-1444. Finding treatment at our family chiropractic practice is simple. All ages are welcome, and we welcome new patients. Same-day and walk-in appointments are usually available, and we work with Medicare and most insurance plans. Flexible payment plans are available. 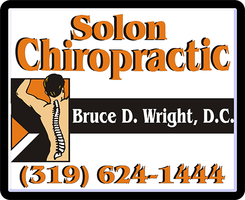 If you struggle with pain on a daily basis, it might be time to visit Solon Chiropractic, Bruce D. Wright, D.C. In our practice, you’ll receive comprehensive, holistic, chiropractic care that helps you achieve overall wellness. Learn About Our Philosophy. From our initial examination to on-site digital x-rays, we’ll explore every opportunity to understand the causes of your discomfort. Rather than treating the symptoms, we’ll develop a personalized treatment plan that addresses a variety of causes. See the conditions we treat. For more information or to schedule an appointment with our Solon chiropractor, call (319) 624-1444 today! Dr. Wright is very good at what he does. He always gets me in as soon as he can. If I call in the morning he usually gets me in that same day. He is extremely knowledgeable, always listens to what my symptoms are and is very personable. I have referred several people to him. My husband and I have been going to Dr. Wright for over 25 years and now our son, Joe, recently hurt his hip playing and went for an initial exam and adjustment. Joe has seen his dad and I get adjustments in the past and had no worries letting Dr. Wright do what needed to be done to alleviate the pain.